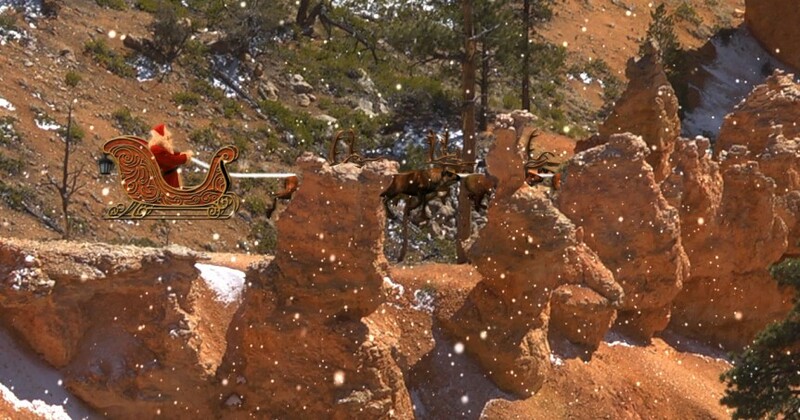 Santa Claus flies through one of the amphitheaters in Bryce Canyon as a light snowfall starts for Christmas Day. He is surrounded by orange and red hoodoos as our video elf Ribbon captures footage of Santa and his eight merry reindeer. In 1923 Bryce Canyon was named a national monument and then 5 years later it became a National Park in 1928. The most commonly seen large animal life is the mule deer, like most Utah parks. Rocky Mountain elk are rarely seen, as are coyote, pronghorn antelope, mountain lion, and desert cottontail.